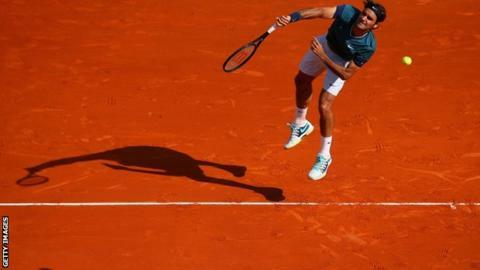 Three-time finalist Roger Federer reached his fourth Monte Carlo Masters final with a straight-sets win over defending champion Novak Djokovic. Federer, 32, won 7-5 6-2 as Djokovic, playing with a heavily strapped right forearm, struggled in the second set. The Serb, 26, had cut his morning practice short and could not keep pace after Federer won a superb first set. Sunday's Monte Carlo title decider will be the first all-Swiss final since Marc Rosset beat Federer in Marseille in 2000. Federer leads Wawrinka 13-1 in previous meetings, although Wawrinka's only win came in the third round in Monte Carlo five years ago. Federer moves on to an all-Swiss final on Sunday against Stanislas Wawrinka, who beat David Ferrer 6-1 7-6 (7-3). Wawrinka, who won his first Grand Slam title at the Australian Open in January, is within sight of his first Masters 1000 victory after his attacking game proved too much for Ferrer. The Spaniard had in the quarter-finals, but Wawrinka dominated as he fired 31 winners to Ferrer's eight. "It was important to move well, be aggressive," said Wawrinka. "That was my plan. I know when I'm moving well and I can dictate the game, I'm always good against him." Federer had lost four of his last five matches against Djokovic, but the Serb had been dealing with a wrist issue all week and it appeared to have worsened ahead of their semi-final. There were fears that he might not take to the court at all after failing to complete his pre-match practice, and he only did so with significant bandaging around his right wrist and forearm. Despite that, the first set was among the best of the year as both men played to their strengths, Federer serving well and shortening the points where possible, while Djokovic defended brilliantly and peppered the baseline. It was second seed Djokovic who fashioned the first opportunity at 5-4, 15-40, but Federer fended off both break points before reeling off five straight points to move 6-5 ahead and closing it out with an ace. The 17-time Grand Slam champion dominated the second set as Djokovic's challenge faded, and Federer wrapped up the win in 75 minutes. "I had the feeling he was not finishing off his shots with as much topspin as usual," said Federer. Djokovic, who later revealed he would be said: "It's unfortunate that when you're playing at this level against Roger, big tournament, that you are not able to play your game because something else is taking away all your energy."